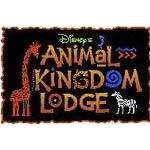 Disney's Animal Kingdom Lodge is an African lodge style resort amidst a 43 acre wildlife preserve. The Resort offers authentic African inspired architecture and the kraal African village landscape design a semi circle design popular in Africa which offers expansive views of the surrounding savanna and its many animal inhabitants. Thatched ceilings, large beams, hand carved golden tone furnishings, real African artifacts and a vast mud fireplace in the main lobby surround you in the inimitable spirit of Africa.